Clark (elbow) said Wednesday that he's fully healthy and won't have any limitations during Green Bay's voluntary offseason workouts, Wes Hodkiewicz of the Packers' official site reports. Analysis: Clark missed the final three games of last season with a sprained elbow. Now healthy, the fourth-year defensive lineman is primed to build off a stellar 2018 campaign in which he graded out as the No. 9 overall defensive lineman, per Pro Football Focus. It helps that he'll have continuity from a coaching standpoint thanks to the Packers' decision to retain defensive coordinator Mike Pettine. The Packers placed Clark (elbow) on injured reserve Tuesday, Rob Demovsky of ESPN.com reports. Clark (elbow) was ruled out for Sunday's game against the Jets, Tom Silverstein of the Milwaukee Journal Sentinel reports. Analysis: Clark was reportedly headed to injured reserve earlier this week, but he described that information as a "miscommunication," according to Rob Demovsky of ESPN.com. The 23-year-old also termed the injury as an elbow sprain and could still end up missing the final two games of the season. Tyler Lancaster should start at nose tackle in his absence. Clark (elbow) will be placed on injured reserve, Tom Pelissero of NFL.com reports. Analysis: Clark suffered an elbow injury in Week 14 against the Falcons, the severity of which now lands him on season-ending injured reserve. With the Packers' playoff hopes eliminated, the team has decided to shut down Clark and avoid any risk of further injury. The former 2016 first round pick will reportedly not require surgery to recover from the issue. Clark's status for the rest of the season will depend on weekly MRIs on his injured elbow, Tom Silverstein of the Milwaukee Journal Sentinel reports. Analysis: Playing would risk further injury, according to Silverstein, and Clark said he is week-to-week with the injury. With the Packers eliminated from playoff contention, there is no need to rush him back. Tyler Lancaster should step in at defensive tackle. Clark (elbow) is inactive for Sunday's game versus the Bears, Ryan Wood of the Green Bay Press-Gazette reports. Analysis: The Packers' defensive front is seriously depleted with Clark out. The standout defensive tackle has 55 tackles and six sacks through 13 games and provides the best pass rush on the defensive line. Expect Tyler Lancaster to fill in for him. Clark (elbow) is listed as questionable for Sunday's game versus the Bears, Tom Silverstein of the Milwaukee Journal Sentinel reports. Analysis: Clark suffered this injury in Week 14 against the Falcons but was able to return and finish the contest. He sat out of every practice this week, but the Packers could just be exercising caution with their standout defensive tackle, who has 55 tackles and six sacks in 13 games. The final verdict on his game status will come with the release of inactives at 11:30 AM ET on Sunday. Clark (elbow) did not practice Thursday, Wes Hodkiewicz of the Packers' official site reports. Analysis: Clark has missed two straight practices after suffering an elbow injury during Sunday's win over the Falcons, putting his Week 15 availability in legitimate question. If the third-year nose tackle were unable to suit up against the Bears, expect Tyler Lancaster to slot into the starting lineup. Clark returned to Sunday's game versus the Falcons after leaving with an elbow injury, Rob Demovsky of ESPN.com reports. Analysis: Clark will return to his position at nose tackle and look to chase down Falcons quarterback Matt Ryan. Clark was forced out of Sunday's game versus the Falcons with an elbow injury. Analysis: Clark has been one of the Packers' most consistent players on defense, compiling 55 tackles and six sacks in 12 games. He's been sent to the locker room for evaluation, and Tyler Lancaster will slot in at nose tackle for the time being. Clark had four tackles (two solo) and a sack in Sunday's loss to the Vikings. Analysis: Clark continues to pile up sacks, notching five over his last six games. He needs just eight combined tackles over the Packers' final five games to set a new career best in that category. Clark had six tackles (five solo) and a sack in Sunday's victory over the Dolphins. Analysis: Clark bounced back from a quiet Week 9 showing with his fourth sack in four games. His 5.0 sacks on the season are already a career best, and he's well on his way to setting a new high-water mark in tackles as well. Clark had five tackles (three solo) and two sacks in Sunday's loss to the Rams. Analysis: Clark was in the Rams' backfield all day, which helped him double he sack total on the season. He has been among the top defensive line producers in leagues that use IDPs, totaling 32 tackles (22 solo), four sacks, and two pass deflections through seven games. Clark posted a career-best nine tackles (six solo) and deflected a pass in Sunday's loss to the Redskins. Analysis: Clark's previous best tackle total came in Week 15 last year when he notched seven combined tackles, but in terms of games played, it did not take him long to top that. The emerging Clark has totaled 16 tackles (10 solo), a sack and two pass deflections through three weeks. Clark recorded four tackles (two solo), a sack and a pass defensed across 55 defensive snaps in Sunday's tie with the Vikings. Analysis: The big run-stuffer doesn't reach the quarterback a ton throughout the season, as he now has four career sacks in three seasons. Clark also logged the most defensive reps of the entire defensive line Sunday, playing in 75 percent of the snaps. Clark made five tackles (three solo) in the Packers' third preseason game Friday. Analysis: Clark has appeared in all three exhibition games for the Packers, and that may be all the action he sees before the regular season begins. Clark will be a key cog in the middle of the Green Bay defense this season, affording him value in IDP formats after tying for 13th among defensive linemen in 2017 with 55 tackles while also kicking in 4.5 sacks and two forced fumbles. Clark finished the 2017 season with 55 tackles (32 solo) and 4.5 sacks over 15 games. 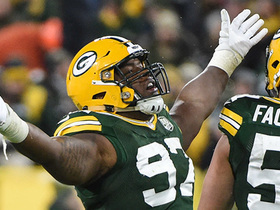 Analysis: Clark took a big step forward in 2017, making big improvements over his rookie season in both the tackle and sack departments while playing the most snaps of any Packers defensive lineman. He has a first-round pedigree to go along with his numbers, and will be a player to keep an eye on in 2018. Clark had a career-high eight tackles (two solo) and a sack in Sunday's loss to the Panthers. Analysis: Clark is now up to 2.5 sacks and 49 combined stops on the season, with the latter number placing him among the top 20 defensive linemen heading into Week 16. Clark had six tackles (four solo), two sacks, and forced a fumble in Sunday's victory over the Buccaneers. Analysis: Clark returned to action after sitting out the previous week with an ankle injury, and he notched his first two sacks of the season while also forcing a fumble that was returned for a touchdown. 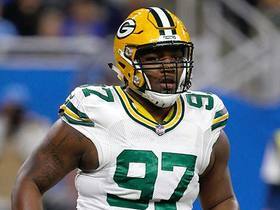 Clark doesn't make much noise in fantasy circles, but he plays a key role as the nose tackle in the Packers' 3-4 scheme. Clark (ankle) is listed as active for Sunday's home tilt against Tampa Bay. 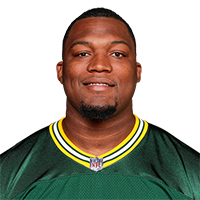 Analysis: Clark will return and hold down the nose tackle position for the Packers, providing a significant boost to their run defense. The second-year player out of UCLA has recorded at least one tackle in every game he's appeared in. His presence will reduce the snaps of fellow nose tackle Quinton Dial. Clark (ankle) is listed as questionable for Sunday's game against the Buccaneers, Tom Silverstein of the Milwaukee Journal Sentinel reports. Analysis: Clark sat out last week's loss to the Steelers but was a limited participant in practice this week. Quinton Dial would likely see an increase in defensive snaps if Clark is unable to suit up Sunday. Clark (ankle) is inactive for Sunday night's game against the Steelers, Packers Director of Public Relations, Jason Wahlers, reports. Analysis: It will be the first game he will miss this year. Quinton DIal and Montravius Adams ought to be the beneficiaries with regards to playing time. Clark (ankle) is listed as doubtful for Sunday's game versus the Steelers, Rob Demovsky of ESPN.com reports. Analysis: It looks like Clark is on track to miss his first game of the season due to an ankle issue sustained in the Packers' Week 12 loss to the Ravens. The fact that he was not simply ruled out earlier is a good sign, as the second-year defensive tackle had to be carted off the field last week. Look for Quinton Dial and Montravius Adams to see increased reps on the line should Clark ultimately sit out. Clark sustained a high-ankle sprain in Sunday's 23-0 loss to the Ravens and is expected to miss some time, Ian Rapoport of NFL Network reports. Analysis: Rapoport reported earlier Monday that X-rays on Clark's ankle revealed the second-year nose tackle avoided structural damage to his ankle, but high-ankle sprains still often require multiple weeks for players to recover from. It sounds like the Packers believe Clark will be back before the end of the season, but his run-stuffing presence could be missed over the next game or two. Clark was diagnosed with a sprained ankle after X-rays came back negative following Sunday's 23-0 loss to the Ravens, Ian Rapoport of NFL Network reports. Analysis: Though Clark avoided structural damage to the ankle, he'll still undergo an MRI on Monday as the Packers look to identify the location and severity of the issue. If Clark's injury ends up being a high-ankle sprain, he would likely be at serious risk of missing the Week 12 game against the Steelers, depriving the team of an important run stuffer up the middle. Clark's potential absence would likely translate to more snaps for reserve linemen Quinton Dial and Montravius Adams. Clark will not return to Sunday's game against the Ravens because of an ankle injury. Analysis: Clark remained on the field for several minutes before eventually being carted off with what looks to be a potentially serious injury. The 22-year-old's departure leaves a thin defensive line unit in even worse shape, with Quinton Dial likely to step in at nose tackle for the Packers. 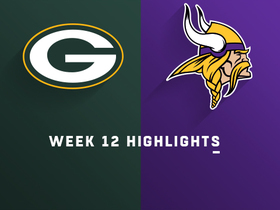 Watch the game highlights from the Week 12 matchup against the Green Bay Packers and the Minnesota Vikings on Sunday Night Football. 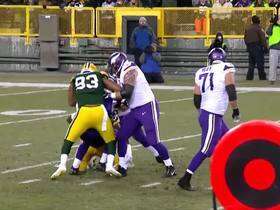 Green Bay Packers defensive tackle Kenny Clark gets clutch third-down sack to halt the Minnesota Vikings' drive. Green Bay Packers defensive lineman Kenny Clark, defensive lineman Montravius Adams, and linebacker Reggie Gilbert sack Miami Dolphins quarterback Brock Osweiler three times in four plays leading to a turnover on downs. 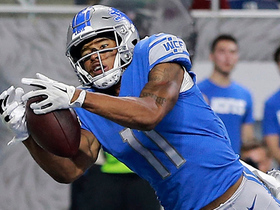 Detroit Lions quarterback Matthew Stafford finds wide receiver Marvin Jones Jr. for an 8-yard touchdown. 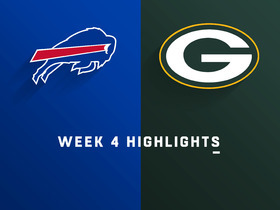 Watch the best plays from the Week 4 matchup between the Buffalo Bills and Green Bay Packers. 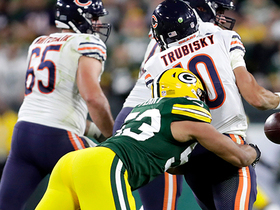 Green Bay Packers linebacker Nick Perry forces pivotal turnover with strip-sack on Chicago Bears quarterback Mitch Trubisky. NFL Network's Stacey Dales discusses the expectations for the Green Bay Packers' defense in 2018 under new defensive coordinator Mike Pettine. 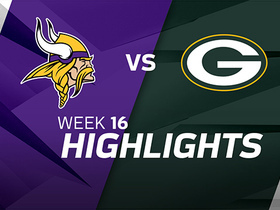 Watch to see the best plays of the Week 16 Saturday night highlight between the Minnesota Vikings and Green Bay Packers. 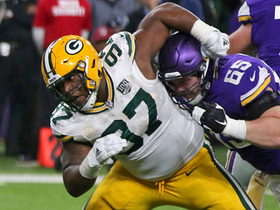 Green Bay Packers nose tackle Kenny Clark takes down Minnesota Vikings quarterback Case Keenum for a loss of 9 yards. 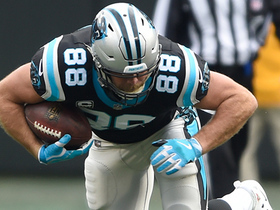 Carolina Panthers tight end Greg Olsen reaches out and snags the one-handed catch on a 4-yard pass by quarterback Cam Newton.